Codemasters today unleashed the 8 Ball DLC pack for GRID. The pack costs €8 (800p) and is available on Playstation 3 and Xbox 360. A couple of images can be found inside. That surprised me, don't understand why they would skip that. Ah, it's coming up, didn't see that part. 800msp no thanks, 400msp maybe. 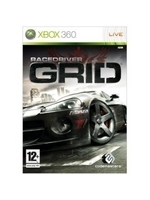 Details of downloadable content for the Games for Windows® edition of Race Driver: GRID will be announced shortly. Damn nice lighting as usual. Thats what I thought. Either you love or hate the controls. I am in the hater-club. Yup. There's one main problem with the controls. The cars just don't feel like cars. Kind of important in a racing game. With this, Burnout, MC:LA, and NFS all disappointing I haven't been able to get an excellent and fun racing game since PGR 4. Does anybody remember on PGR 2 when they released DLC with not only new cars, but also entirely new cities/backgrounds to race in? Now THAT'S how DLC should be done in racing games. Not this 8 cars for $10 BS! This isn't at all proportionate to the $50 or $60 that you would've payed for all the content on the original disc either! I know, It's sad.. But I bet you this BS will still sell well.. To many people are to ignorant or simply don't care.. The industry managed to make it feel normal to pay for BS now.. It's even so bad now that if you moan about it fanboys will tell you to shut up and defend this BS with socalled free choice arguments etc..
Too Little Too Late.... Come on' the game came out in June 2008 for PS3.. If you are going to release download content why not do it in the first 2-3 months of release.. when people are still hyped and playing the game.. This type of thing should be free, they should be grateful if anyone is still playing and when you look at how huge the car selection is in other racing titles, charging gamers for some new cars feels like a rip off to me. Does anybody remember on PGR 2 when they released DLC with not only new cars, but also entirely new cities/backgrounds to race in? Hah, I just downloaded the Long Beach tracks a few weeks ago. Maybe they are doing it to keep the game alive. Maybe some people do buy the dlc and start playing the game again. Imo every DLC that arrives 2 months after release is a rip-off.